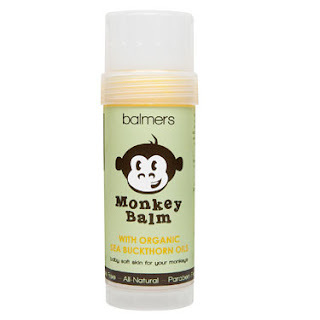 Beautiful Incentives: Monkey Balm Review & Giveaway! Monkey Balm Review & Giveaway! I had the chance to try out Monkey balm. It is meant for little monkies. I don't have any of those, but what I do have is dry skin and other beauty maladies that i've heard it may be able to help. When I searched for opinions on the matter, I got a lot of raves about it combating dry skin and even acne, which isn't on the list of things it combats. It is filled with all natural components, nothing that would irritate sensitive skin. My first impression was the smell. It is kind of a waxy fruit smell. Not unpleasant at all. The texture is alright. It is a bit oily and sticky. The stickiness comes from the beeswax I am assuming. I've never been big on that ingredient in anything. Not a huge turn off, but not something that I could slather all over myself. It goes on clear and smooth and it's packaged very conveniently where you twist it up to get more. It is basically like applying one huge lip balm on your body. patches, keratosis ( little skin colored bumps on my outer arms) My dry patches on my feet and toes, and my cuticles that I tend to cannibalize. I did notice a significant improvement on the dry patches on my cheeks, so I decided to put it on all peeling and dry areas. My cuticles and feet it worked the absolute best for. I read that putting it on your feet and then covering it with socks overnight really helps cracked/drying heels, and it does. Everything became soft and smoother but, this is the type of treatment that needs to be kept up in order to keep it at bay. As soon as I washed my body, the dry spots were back. Also, it didn't do anything for my acne or the bumps on my arms, but I am going to keep at it and report if it ever does. 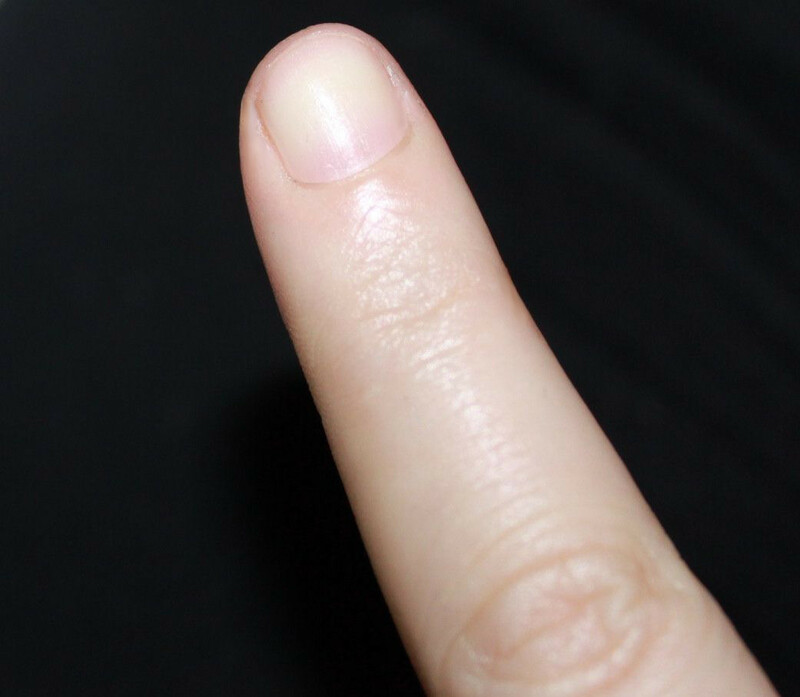 Pictured to the right, is my healed cuticle after a few days of 1 application per day. Not perfect, but much better than before. My overall impression is that it is indeed a healing balm, with regular use. I will have to step up the applications to 3 times a day to see if it does anything dramatic. It is definitely a product I will stick with for my dry patches. The running cost for Monkey balm is $15.95 and it seems like it will last a good while, so I think the price isn't too bad. Today i'm offering one lucky person a free monkey balm of their own! Good luck! I would like to try it for MY feet too! I never thought to use Monkey Balm for eczema! !I would also like to try it on my feet! Excellent review!! TY! What a neat and fun product! I have so many skin issues! I love the portability of the balm. I have a 2yo boy who is getting more diaper rash lately and I could use something to help! Thanks for the giveaway! My daughter has eczema and I really hope this can help her with it. I also have really dry elbows and feet regardless of what I use so I hope this can do something for me too. My son has dry sensitive skin. My family has dry skin and we could use Monkey Balm. because it would be great for our dry elbows and heels. My skin is really pasty and doesn't tend to stay moisturized for much longer than right after I put on lotion, this looks great for that! I could definately use this on my feet. This would be great for my dry skin, especially my feet. he gets dry skin in the cold and the winter is coming!